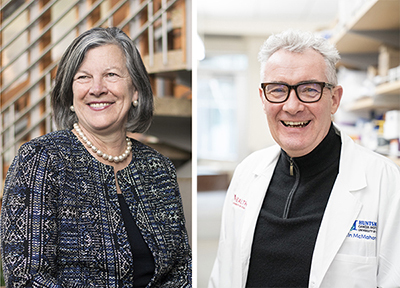 Huntsman Cancer Institute (HCI) CEO, Mary Beckerle, PhD, and HCI’s Senior Director of Pre-Clinical Translation, Martin McMahon, PhD, have been appointed to prominent advisory group positions within the National Institutes of Health. McMahon has been appointed as Chair of the National Cancer Institute (NCI) Board of Scientific Counselors for Basic Sciences. This board evaluates federal basic science research programs at the NCI Center for Cancer Research. It also advises the NCI on a wide variety of scientific issues, including future priorities for federal basic science research. McMahon also serves as a professor of dermatology at the University of Utah. Beckerle will serve on the NCI Board of Scientific Advisors. This board consists of leading experts in cancer sciences and training the next generation of cancer researchers and caregivers. The board makes recommendations to the NCI on research areas that should be prioritized through this federal agency’s funding and mentorship programs. Beckerle is a distinguished professor of biology and oncological sciences at the University of Utah. McMahon and Beckerle were appointed to these positions by the NCI director. These advisory boards provide the NCI with objective and expert advice that is used to coordinate national cancer research initiatives, prioritize scientific areas for funding, and provide insight on the direction of the national cancer clinical trials programs to accelerate the impact of cancer research across the nation.